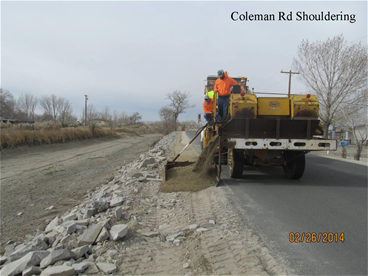 It is the responsibility of the County Road Department to upgrade, repair, and maintain all County roads, bridges, and related infrastructure. Currently the County road system consists of approximately 191.31 miles of paved roads, 254.79 miles of unpaved roads, and hundreds of various types of bridges and culverts. To ensure quality control, and to utilize tax dollars effectively, all maintenance and repairs to our roadway system are accomplished utilizing Road Department personnel. This includes major paving and chip sealing projects, major bridge replacement and reconstruction, culvert replacement and repair, pot hole patching, crack sealing, tree trimming along roadways, removal of dead animals and debris within our easements, de-icing and snow removal, traffic control, and traffic sign maintenance. Our mission is to utilize our gas tax revenues to provide the traveling public with a safe and effective roadway system throughout Churchill County. For emergencies after hours, please contact the Sheriff's Department at (775) 423-3116. Why doesn't the county maintain all the roads in Churchill County? Are my property taxes or registration fees used to fund the County Road Department?